APSA president and founding member Ron Konowitz, 60, is a retired teacher from Keene Valley. He believes the APSA can work under guidance from the Department of Environmental Conservation to maintain safe, minimally invasive, skier-specific backcountry trails. While backcountry skiing is technically permitted in the Adirondacks on existing trails, the APSA says they are too narrow and dangerous to skiers and others, like hikers, who may be around a corner. 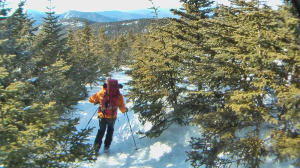 To provide a safe skiing environment, required maintenance would include cutting of fallen, dead trees (known as ‘blowdown’), lateral branches and saplings, and the removal of brush. Mr. Konowitz says that APSA volunteer trail crews, insured by the APSA, would be trained by the DEC and conduct trail work during the warmer months, followed by inspections by DEC foresters. He says APSA has been communicating and working with the APA, DEC, Adirondack municipalities and environmental groups — including the Adirondack Council, Protect the Adirondacks, Adirondack Wild, the Adirondack Mountain Club and the Wildlife Conservation Society — over the past 30 months. Mr. Konowitz describes himself, and many APSA members, as conservationists. “We don’t want to weaken protection” of the Adirondack Park, either, he says. The DEC granted permission for APSA to conduct a demonstration last winter in Ray Brook, attended by the DEC, APA, environmental groups and other interested parties. In October, the groups met for a roundtable discussion, advising the APSA to seek an amendment. Mr. Konowitz says the reception has been positive. “What we’re proposing is low-impact, human-powered recreation,” he says, positing that maintenance of hiking trails has a larger impact due to removal of top soil and construction of rock steps and drainage systems. Mr. Konowitz believes that backcountry skiing will bring a boost to local economies through a new wave of eco-tourism. A meeting is set for Dec. 8 in Warrensburg, with the DEC, APA and environmental groups offering input. For now, Mr. Konowitz encourages the public to address comments via mail or e-mail to APA Planning Director Kathy Reagan before the Dec. 5 deadline. A link and information can be found at the APSA website: www.adkpowderskier.com. Copyright © 2014 Lone Oak Publishing Co., Inc. All Rights Reserved.